Spending some time in the Dallas area for the next three weeks with nothing to do on the weekends. Hate to invite myself aboard. Just saying if anyone in the area needs a hand I'll be around, even if it's just working on one. We're on the hard right now. 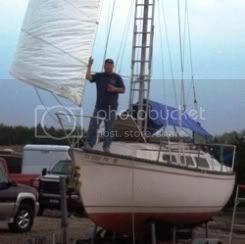 Fixing the keel trunk leak and getting new paint and running rigging. If you're back in the summer please call! We're always open to victims . . . scratch that I mean guests. Open for a beer any time! Let me know and we can meet out at Hubbard. Great restaurants and beer places all over the lake. Just thought . . . we're getting the ski boat ready this week. We can sure give you a tour of the local lakes via a really fast stink pot. I'll be flying out Tomorrow. Just pm me your phone numbers and I'll contact you guys during the week.